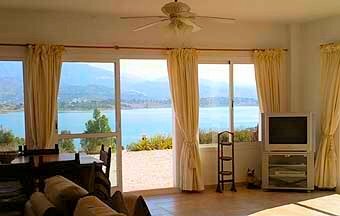 A very exclusive villa with uninterrupted views over Lake Vinuela in the Axarquia region of Southern Spain. There are 3 bedrooms and two bathrooms - one of these being a shower room en-suite to the master bedroom. The spacious sitting room is open plan with three sets of sliding doors, two facing the swimming pool and the third opens out to a fabulous lake view. There are two very large feather upholstered sofas, Sky TV and antique furnishings. The swimming pool area leads to the tropical landscaped gardens which have views over Lake Vinuela and the surrounding hills. This is probably the most spectacular feature of this magnificent property - the views are just amazing. 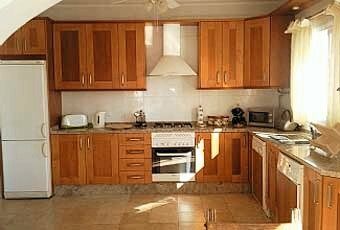 The kitchen as you would expect from a property of this caliber offers every convenience. This includes dishwasher, washing machine, microwave and fridge freezer. There is a separate laundry room with washing machine and tumble dryer. The lake is well stocked with carp and brown trout, it is also well used by wind surfers. All forms of non motorized water sport are permitted. The villages which surround the lake, Alcaucin, Vinuela, Los Romanos and Puente Don Manuel are friendly places that have been virtually untouched by tourism. Each has a few simple restaurants and bars offering real and well cooked Spanish food, mostly locally grown. There are two excellent lakeside restaurants and grocery shop just 5 minutes stroll away. 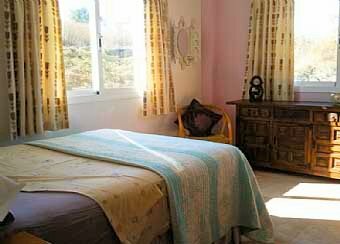 Whatever your taste if you enjoy the countryside you will be delighted with Lake Vinuela.